Jim Lauderdale is a 2-time Grammy winning Americana icon, a singer-songwriter whose unmistakable rhinestone-incrusted silhouette has been a symbol for creative integrity and prolificacy for thirty-one albums over decades of recording. He’s an A-list Nashville songwriter whose songs have ruled the country charts while recording an eclectic catalogue of albums that run the gamut of American roots styles. His prolific streak of releases continues in 2019 with his new album ‘From Another World’. The ten songs contained within, all written or co-written by Jim, are his antidote to the anger, divisiveness of today’s world, a world full of bad news and folks yelling at each other on CNN. This is music from another world, a world of empathy, love, forgiveness and humility. Where people find freedom through togetherness, where they struggle to change for the better, where country music still cries with the sound of pedal steel guitar and psychedelic-tinged lyrics flow through aching indelible melodies. 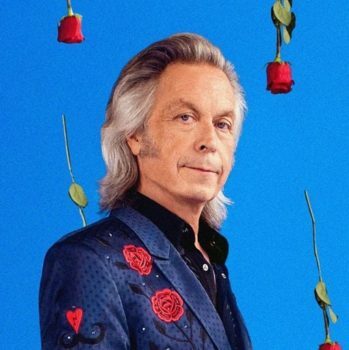 From the start of his career, Jim Lauderdale has been creating his own musical world. Too expansive, eclectic and creatively curious to fit into any prescribed genre boxes, he innovated what is now called Americana music, long before there was a term for it. Everything about the man and his music is classic and timeless, but he’s a total original. The McCartney-esque melodies sung in his aching high lonesome tenor, the fiercely authentic bluegrass songs with mind-expanding psychedelic lyrics… nothing about Jim’s music can be reduced to a single influence, and no other songwriter would fuse these classic strains of tune-craft into such unexpected but immediately satisfying combinations. The scion of a preacher dad and music teacher mom in rural North Carolina, Jim’s world was turned upside as a kid when he saw the Beatles explosive debut on Ed Sullivan, rewiring his creative mind. Teaching himself a variety of instruments, Jim explored songwriting as a teenager, fueled by a musical diet that ran the gamut from George Jones to the Grateful Dead, Al Green to the Stanley Brothers. A visit to Nashville opened Jim’s eyes to how hard he would need to work to realise his dreams of emulating his troubadour heroes – recording a bluegrass album with legendary mandolin player Roland White, but unable to find a record deal (the album was finally released last year). In 1980, Jim headed to New York City to cut his teeth in the country clubs, making fast friends with fellow musical iconoclasts like Buddy Miller and Shawn Colvin. Jim honed his live chops and graduated to Los Angeles, where he spent the late 80s at the center of the fiery alt-country scene alongside Lucinda Williams and Dwight Yoakam, packing out the Palomino Club and catching the eyes of the local crowds and industry alike, leading to his first record deal. While his classic 90s albums like ‘Planet of Love’ and ‘Pretty Close to the Truth’ drew him rave reviews, Lauderdale’s musical style was too eclectic to fit easily into the major label country box. There was no genre label for a left-of-center blend of country, blues, rock, soul, folk and bluegrass, so Jim had to pioneer one. These days, the identity of Americana music and Jim Lauderdale are one and the same. The first ever winner of the Americana Music Association’s Song and Artist of the Year trophies and the honorary Wagonmaster award, Jim also served as host of the awards for many years. While some people struggle to define what Americana music is, others just point to Jim’s eclectic but totally cohesive catalogue as the defining example. Although he never got to work with his idol Gram Parsons, who Jim immortalized in his classic signature song ‘The King of Broken Hearts’ (also the title of a feature documentary on Jim), Lauderdale has realized that great dream of any musician – to stand shoulder to shoulder making music with his biggest inspirations. His duet albums with bluegrass icon Dr Ralph Stanley earned Jim his first Grammy award, he’s penned albums worth of bluegrass gems with Grateful Dead lyricist Robert Hunter and he’s on a short list that includes Paul McCartney and Allen Toussaint as a writing partner of Elvis Costello. With his new album ‘From Another World’, Jim has once again opened his heart wide and delivered a record of original songs that plays like a greatest hits set. From the opening one-two punch of hard-charging Dylanesque ‘Some Horses Run Free’ and desperation-led waltz ‘When You Can’t Have What Your Heart Wants’, it’s obvious Lauderdale is firing on all cylanders. ‘The Secrets of the Pyramids’ evokes the twangy psychedelia of the Byrds at their best, rich in harmonies from Third Man Records star Lillie Mae and her brother Frank Rische. The video is a tounge-in-cheek homage to the clip for Toto’s ‘Africa’ and features Jim and acclaimed singer-songwriter Elizabeth Cook in starring roles. Nothing evokes the ghosts of George Jones like instantly classic country love songs ‘For Keeps’ (released this year on Valentine’s Day), ‘Like People From Another World’ and ‘I’ll Forgive You If You Don’t’. The expansive, questioning ‘One Away’ leads into the empathetic finger-picked ‘Listen’. ‘Slow Turn In The Road’ is a bluesy chug lead by stinging guitars and a deeply soulful lead vocal, ‘Ever Living Loving Day’ is the kind of clever-but-playful lyric Jim can write like no other and the album culminates in the wild rave-up ‘Are You Trying To Make A Song out of Us?’.